Flow has been available for some time now as a beta program wthin Office365 offering Cloud orchestrated business workflows. What does this actually mean to a business user? These workflows offer businesses the opportunity to automate, improve operational efficiency, reduce room for error and encourage repeatable experience by automating ugly and resource intensive manual processes. Now Flows has been integrated into SharePoint Online lists in a new menu titled “Flows”. 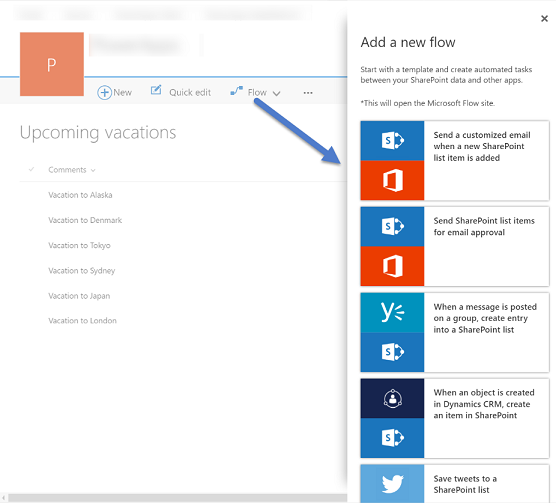 If you are not seeing the new modern lists yet in your Office 365 tenancy you can see one here… https://flow.microsoft.com/en-us/blog/microsoft-flow-integration-with-sharepoint-modern-lists-preview/?WT.mc_id=azurebg_email_OneRM-MSFlow-OneOff-FY17-09Sept-22-Service+Updates-SeptLearnMore. These Flows are easy to use, with features like People Picker to assist you in creating Send Mail actions. It’s now easier than ever to use the Send Email action. A new Microsoft Graph People Picker is integrated directly into the Microsoft Flow UI to help you choose the right contact or email address. Comparing Flows (accessible in your Office 365 subscription) vs SharePoint Online List Flows is like comparing Apples with Oranges. Flow offers much more, like the ability to automate a workflow when a Document gets created in a Document library for example. SharePoint Online only offers Flow in Lists at present, but expect the capability to be rolled out further in the near future. Want to know more ? There is a wealth of documentation here… https://flow.microsoft impotenciastop.com.com/en-us/documentation/getting-started/?WT.mc_id=azurebg_email_OneRM-MSFlow-OneOff-FY17-09Sept-22-Service%20Updates-SeptLearnMore. The opportunity to streamline your business has never been greater – Get in SharePoint online list Flows!